Welcome to 2018 and happy new year. Please remember that the admin of this site have banned global warming discussion on this forum so kindly take it elsewhere. 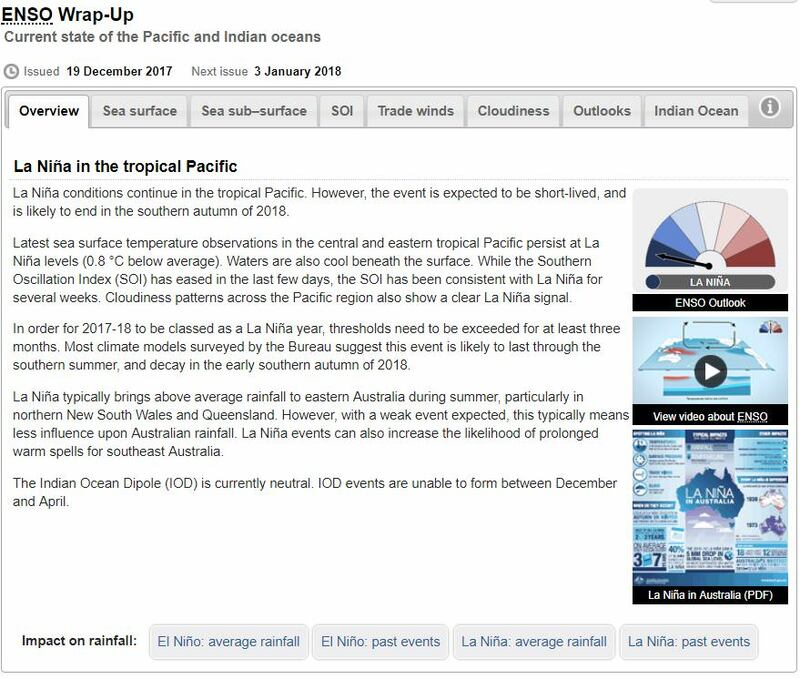 The official ENSO status at time of writing is Weak LaNina and there is division about its effect on certain areas of Australia. 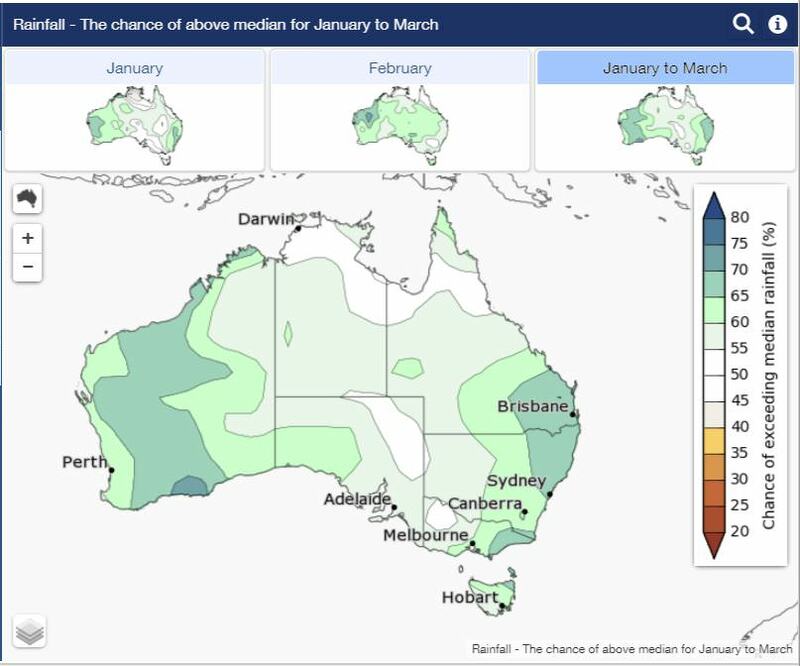 I thought I'd start with BoM's rainfall probabilities for Jan-March issued on the 21st of December for the sake of reference in a few months time. and BoM's most recent ENSO update. 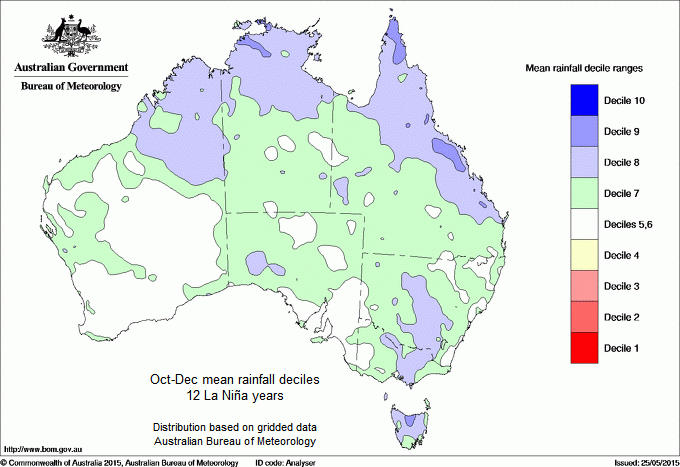 ...and October rainfall which broke records around the Wide Bay region. This LaNina was very late developing. 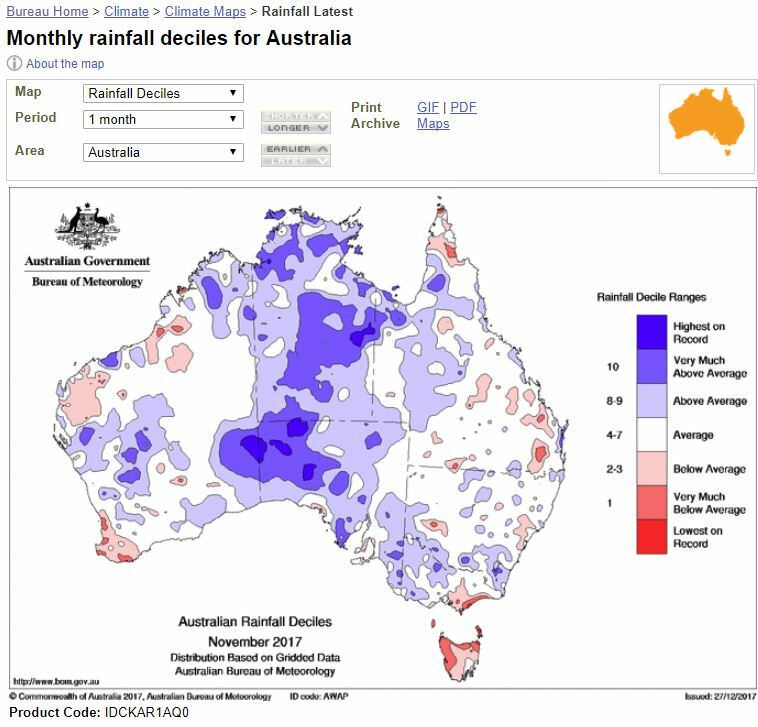 I didn't even realise the areas near and around T'sville and Cairns got record rains in Oct as well. Nov above average too, so even if Jan-Apr are average or slightly below, they'll finish with an above avg wet season. In other news, the disturbance on the NT/QLD border is getting close to the GOC potentially developing into a TC, swinging around the NW and doing a Hilda. Just a theoretical. 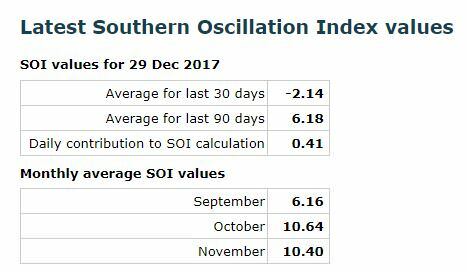 December wasn't so great though in many parts of NQ (we did well here in Wide Bay) and areas like Townsville are off a low base in October also. That trough pushing north is what EC said would drag the monsoon down. That MSC on southern GoC looks like a continental squallline often associated with the northward moving trough developing into a monsoon trough. NE NSW/SE QLD getting their severe storms on an almost daily basis, giant hail at Kempsey and few other places as we speak - typical of La Nina. Whether it has time to explode into the mature stage time will tell. If it does, and those SST’s remain off the east coast, then look out. Still looks pretty La Nina’ish to me, even with the late start. Indeed, they're also pointing out mostly the negatives and ignoring those big positive falls, even if some are not widespread, are still significant. My bet is a change to troughy conditions for the east coast from about mid-Jan. EC is hinting around the 10th. Total for complete months since nino 3.4 went below 0 (mid August) is 10mm below average. They’re all over the place this mob - one minute “one months great rain doesn’t make it a La Niña” then “one months bad rain means his La Niña is a dud..” sigh wish they’d make their minds up. Meanwhile it just keeps rolling on, with deep active trough and another day of supercells across QLD and NE NSW. GFS is predicting another big trade wind burst shortly. 23mm below normal. 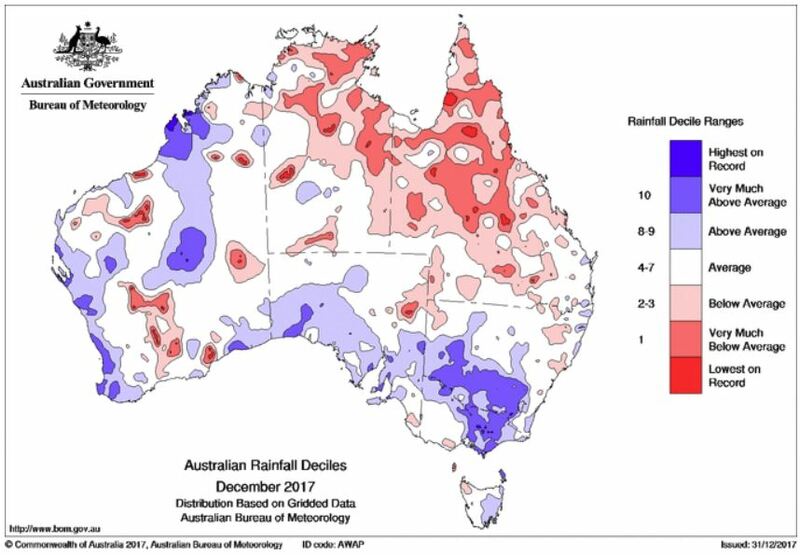 For the whole of easte...rn Australia, ....hmm to state a deficiency in terms of mm rain, can I assume that you believe the whole east coast of Aust. experiences identical rainfall averages? I was under the understanding storm activity is generally not indicative of either an El Nino or a La Nina. La Nina would mean broad trough systems dumping general rain on a wide scale. Not lots of small isolated storms that might eventually all join up to make it appear like general rain has fallen. RC that’s a misconception. Moderate to strong La Nina’s are more prone to rain events, sure, but cool neutral to moderate la Nina’s imo are prone to Wet storm events. we had one wet day in october, the average is about 15mm, we smashed it. was the first rains since May, and we have had just one 15mm storm since. 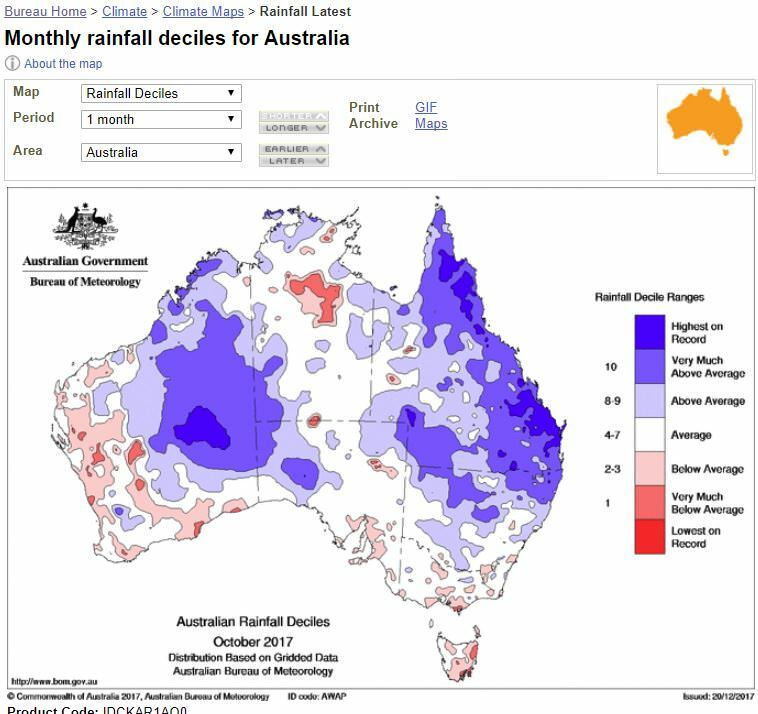 one wet day in 7 months does not mean the drought has broken and La Nina has its claws on us. Because of course, a La Niña is purely judged on whether one gets rain over their particular area. Meanwhile, a thousand km of the east coast today is under severe storm warnings, with massive hail, damaging winds, tornados and torrential rain falling, but hey, nothing to do with La Niña. Wow at the current widespread storm outbreak across large areas of QLD/NSW. Lovely moisture streaming in from the MJO 4-5 Indonesian region? .....now it's us in SE Aus getting jealous! 4 registered (Mike Hauber, wetdreams, Multiversity, Longys), 59 Guests and 4 Spiders online.